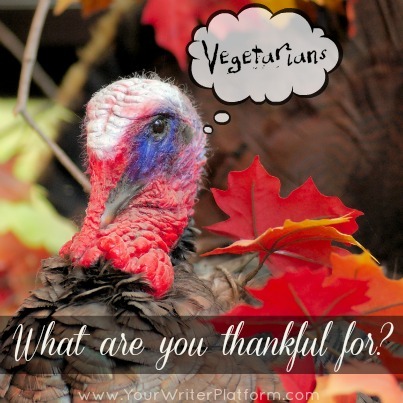 This is Thanksgiving weekend here in Canada, and I wanted to take the opportunity to thank you for your support, your comments and your efforts in helping me share with fellow writers the information (and inspiration) needed to market our books and build our platforms. It is immensely rewarding to be able to do work that I love, while helping others, and I so appreciate you allowing me the opportunity! And in the spirit of extreme gratefulness, I thought I would share with you this video by Shawn Achor, who discusses how small changes that we can make daily (like showing gratitude), can turn into lasting positive changes in our ability to be happy and successful. According to Shawn (and I agree), our formula for happiness and success is broken. We aren’t happy until we meet some measurement or attain some goal, but those measurements and goals are moving targets: once we get there (if we get there), we quickly set the bar a little higher. He suggests that if we find a way to to be positive in the present, we’ll start to see what we are really capable of. I’ll be putting this into practice; if you do as well, shoot me an email and let me know how it goes! Elisabeth shares some clear and practical advice on firing your agent, including understanding your reasons for why you think you need to. From the archives, this post lists some of my favourite sites that help writers with everything from writing and publishing to book marketing and social media. Wonder what to expect after the contract is signed? Randy shares a helpful timeline to calm your nerves and give you an outline of the process after you get ‘the first cheque’. Jason walks us through some great ways to make sure our metadata is working for us (not against us), and he includes a video tutorial as well. I did this before I realized it was called mind-mapping! This is a super helpful post that not only helps you get started, but gives some super creative ways you can use mind maps to get what’s in your head, out! A review by the Wise Ink gals of their experience at this year’s WD conference, with some insightful takeaways on self-publishing, writing and working with a publisher. “You were born with the gifts for running your own show”, says Farnoosh. Find some inspiration in this list to get your authorpreneurial juices flowing! James shares 5 valuable tips, with some great examples, on how to enhance your YouTube marketing. Self-publishing doesn’t necessarily mean you have to do everything yourself. Joel describes how he got caught -and how he got himself out- of the ‘DIY trap’. Derek discusses the value of having -and the difference between- dream goals and realistic goals. Watch the video to learn Derek’s secret for earning $10,000+ per month. 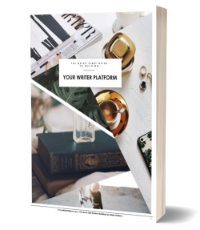 Here is a simple, ten-step guide to self-publishing for those just starting out. “Small doesn’t get the respect it deserves.” Corbett wants us to change our thinking about what it is to be ‘small’ or new (or aspiring). Celebrate where you are at, right now, because your impact can be significant. 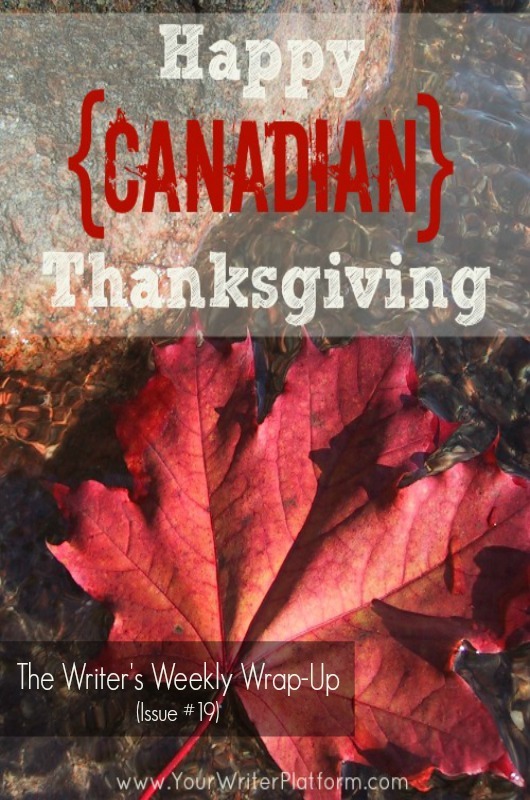 For my Canadian readers, please have a safe and wonderful Thanksgiving weekend! And for those of you in other parts of the world, enjoy your Sunday! Thank you for these great links, Kimberley.